First question, is FTTP orderable at your address ? If not, you might be getting little help because �computer says no�. It may all become a lot easier when it is available for order where you are. I suspect Mr.Fox succeeded as the second port was enabled by Zen who are a bit more �together� over such things. I think we are talking about an FTTPoD-already-in-progress location. Computer will say "no" to WBC FTTP until shortly before the FTTPoD service goes live. The question really boils down to this: is it still possible to have two FTTP services at the same location, given that OR are now only installing single-port ONTs and single pre-connectorised fibres? I think you'd just have to order the second FTTP and see what happens. They might swap the ONT for a 4-port; or they might install a second ONT and fibre. Or they might just say no. In my case, I intend to ask the engineer if they have a 4-port ONT available, or if they'll pull two fibres. I have installed some conduit for the fibre to go through; it would be a shame to pull one, only to destroy it later to pull two more. 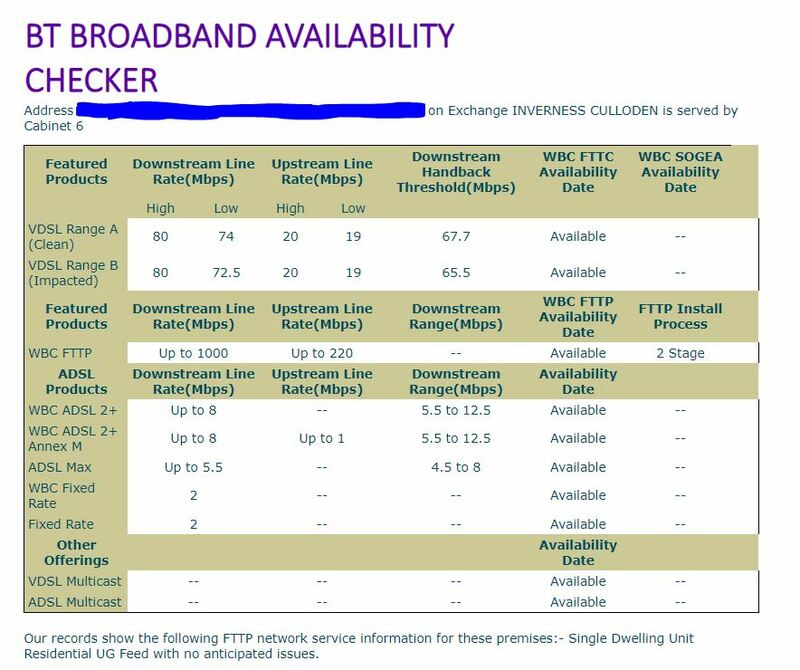 You'll have to wait until the BT checker starts showing 'WBC FTTP' for your property which will only happen a few weeks before your FTTPoD service goes live. Get in touch with Cerberus or BT at that point and they will advise you if you can order a second FTTP line then and possibly get it activated at the same time as FTTPoD (or shortly afterwards). Otherwise you will have to wait until your FTTPoD is live. I too would be very interested to find out whether this is possible. We have FTTPoD installed under the old scheme. The engineer arrived and said that whilst he could have put the new 1 port ONT in for us, as we're mixed residential and business he said he'd put a 4 port ONT in as he had one in his van and so we have that in place and working. The checker for us is an interesting one. Before it was all installed although in the final stages, the checker said WBC FTTP available and we could have placed an order with another supplier. When it was activated however, the checker changed and now says FTTPoD 1000/220 available however and not native FTTP. I spoke to Cerberus about this and apparently after the 3 year term it will change to native FTTP. That said, the engineer said that we could have up to 4 ports on the ONT running with FTTP and there wouldn't be a need for another engineer visit as the ONT ports could be activated by an ISP remotely. We would like to potentially order another FTTP connection although on the checker it says we don't have native FTTP (even though it's installed and running) Therefore, we are unable to order. Can anyone shed any light here as the infrastructure is all there and in place! The checker for us is an interesting one. Before it was all installed although in the final stages, the checker said WBC FTTP available and we could have placed an order with another supplier. When it was activated however, the checker changed and now says FTTPoD 1000/220 available however and not native FTTP. I spoke to Cerberus about this and apparently after the 3 year term it will change to native FTTP. In your case it sounds like a classic Openreach database error. I would email Mr S (Andrew) your details so that he can prod Openreach to fix this, otherwise no ISP will let you order a second FTTP line. Pull one plus a second drawstring and leave that in situ. That can be used to pull another at a later date. If it's not a long duct run and a bit space to leave a bit of cord I usually use a puller twice the length secured both ends, easy to pull either way as many times as you like. Yep, that's not a bad idea, thanks. The checker has gone to WBC FTTP available for my premises with the latest update from Cerberus being - "Openreach confirmed that Civils are now reported as complete. Underground cabling is in progress with local Openreach cabling team."